I like to think of the roadmap as a treasure map. 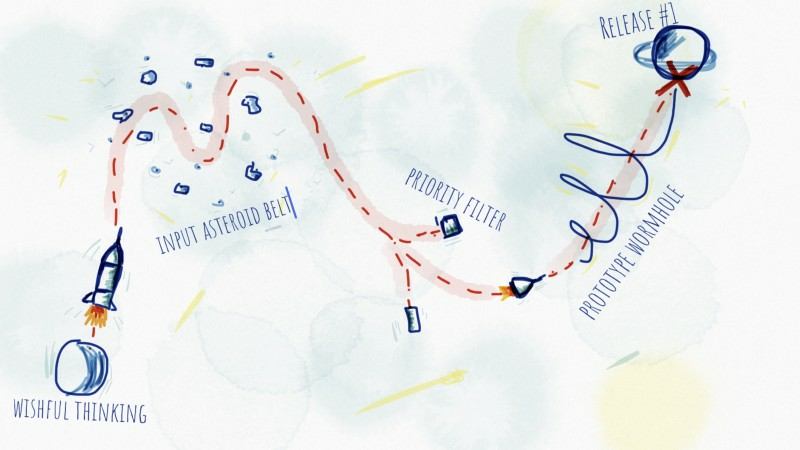 Each treasure map has a starting point, a goal (treasure) and a twisty windy line connecting the two. This is the essence of a good plan, three key ingredients: 1. starting point and self awareness (where are you today and what are your abilities), 2. vision and goals (where do you want to be and what do you want to get) and 3. tactics and objectives (connecting 1 and 2, how am I going to get there). Figure out what you want to build and visualize it in your head. Get as much input as possible (market needs, key features, customer feedback, differentiating features, delighters…). Brainstorm, sketch and pile up a sh*tload of features, work exclusively on quantity. Prioritize and create a development timeline. Prototype, get feedback and revisit all these steps again and again. There are always a million ideas and opportunities that product teams could be pursuing. The product roadmap is supposed to show everyone which idea to focus on. Building a vision statement is intentionally the first step in the process of building the roadmap. Before anything else, you have to figure out which goals do you want to pursue and share that idea with your team. The vision is the long-term thinking. It should say what you (your company) want to become. The vision should answer the “Why?” question, the core of every successful business. When you figure out your “why”, both customers and employees will understand your ultimate goal and their role in your plan. The vision should present your ultimate goal — the treasure spot on your map. Whatever your vision may be, it is important to put an X on your treasure map so that everyone onboard can have their eyes on the same prize. Working towards the same goal will help in making decisions, understanding the desired outcome and will help in finding a way to overcome obstacles along the way. IMO, the most effective way of describing your vision is describing the box, the package for your product (this is applicable for a digital product as well, you will not put it in a physical box, but you know… use your imagination). The real-estate on a box is limited, which means that the most important features can get their space on the package. This level of abstraction is just right for this stage. From the users perspective, this is the first thing that he/she notices, so make sure that you emphasize how will the product make them awesome! Now that you have an idea about what you want to build, you can dive into details. Since the roadmap is essentially a set of decisions, make sure that you have as much input as you can. This way, the decision (roadmap) is based on facts which make it more likely to be successful. When it comes to inputs, the best return on time invested (ROTI) is market research. Most of the time, we tend to think about the solutions first, and then trying to find a market where our product can fit. But the opposite approach should be considered. You should listen which problems are your clients facing and understand their pain points. Once you understand what are they dealing with, you are ready to think about the solution. The best opportunities for you will arise from the tasks which have high importance for your clients but very low satisfaction with the current solution. 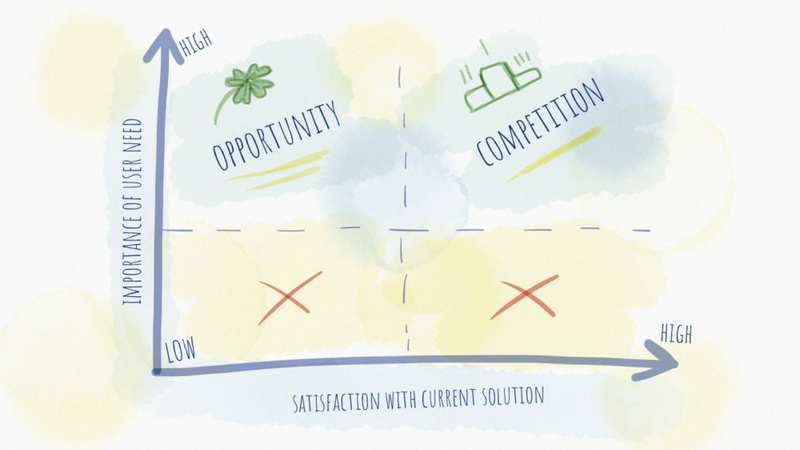 You can spot four quadrants here, and each of them brings valuable information for building your roadmap. So we are thinking in importance of the need and user satisfaction domain. This is the sweet spot for you, this is what you want to tackle and improve user satisfaction with your solution. This area is reserved for mission-critical tasks that your clients are performing. These tasks are important for their jobs but their satisfaction with the current solution is very low. Improve on these and they will love you! If you want to earn $1 million, solve a $10 million problem. Again, these tasks are extremely important to your customers. But in this area, they seem fairly satisfied with the current solution. This is the zone where you have to disrupt. You have to provide a 10x better solution. The solution which makes them more awesome and their job much easier. This is also an area with lots of competition, so you will have to work hard on the solution and provide some nice differentiating delighters. They will put you in front of your competitors and will make your users happy. I think this one is obvious, you shouldn’t be investing your time in solving these problems. Somebody already provided a solution which seems right and the importance of the task or the frequency of usage will not make anyone switch to another solution. There are plenty of mediums which you can use to gather customer feedback. Interviews, surveys, prototyping, cold emails, casual conversation, free trials, etc. But each medium shares the same goal: Get to know what your customers need. You’ve done a market research which helped you identify the target market. But there is no better way of figuring out what your customers need than asking them. They will help you articulate the problem space. And the problem space is where you want to get comfortable. You should fall in love with the problem, not the solution. The key in this step is to listen. And listen carefully. Take notes and figure out major pain points. If you get the pain points and understand their real need, you have a high chance of nailing the solution. You don’t necessarily build the thing that the customer requested — they are not designers or UX engineers. Again, listen carefully and give them something that they haven’t thought of yet, but what you think they will love. Work your roadmap around these pain points. Thinking about your vision certainly sparks some ideas about how can you empower your users. These ideas are also a valuable input for your roadmap building process, so make sure you take them into account. As a user, I want to X in order to Y. An X is a solution which solves the Y for the user. The Y-s are those chunks of added value which you are seeking. These ideas are tactical suggestions for improvements. Usually, this is where innovation happens. You won’t get these inputs from the customers. Innovation happens when you spend hours and hours on understanding the problem you are solving and solving it 10x better than everybody else. 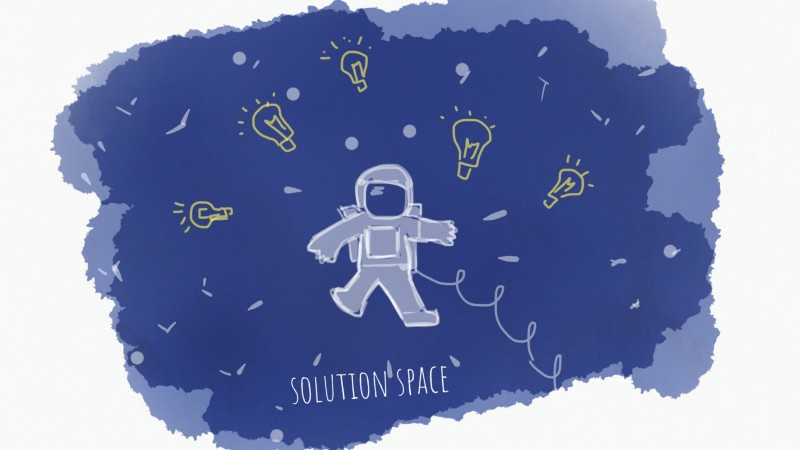 So definitely spend some time in the solution space. This is another input which is crucial for your roadmap. This input basically depends on your creativity and hard work invested in solving the problem in the best way possible. It is that key feature, that 1% better solution which delights the users. Differentiating feature is what makes you stand out, what makes you better than your competitors. Of course, you have to develop parity with the competition, since you’re in the same problem/solution space. But in order to attract the customers to your product, you have to think about the neon lights flashing and pointing to your product. How to come up with this differentiating feature? Well, most of the time we start by doing a competition study. This is probably a bad idea if you’re seeking for new ideas. Studying competition will make you biased with their solution, making you less capable of innovation, since these inputs will influence your thinking. As a result, you’ll probably come up with a copy of somebody else’s solution. To come up with a new idea, you need to put yourself in an environment which will provide you a different perspective on the problem. I love the concept of crazy 8s from Jake Knapp’s book (Sprint). It suggests folding a sheet of paper three times. Foldings will form 8 equal parts on the paper. And the idea is to force yourself to sketch 8 different solutions for the same problem. Most of the time you can come up with only two or three variations of a solution, but forcing yourself to sketch 8 will definitely result in something interesting and new. Now that you’ve done lots of research, listening and thinking its time to write these inputs down and do some prioritization. You’ve already done the heavy-lifting, you just have to write some work items down. Work exclusively on quantity! The more the better. It doesn’t matter if you think some ideas are crappy, write them down, maybe they can merge with some other crappy idea and form a good one. This step in the process means gathering all the things (work items) you might be doing, all the things which could contribute to your product being the best out there. The form of each work item should be descriptive enough for you to know what does it refer to. You should know what feature it is just by looking at the title written on the sticky note. You’ll end up with a pile of stuff that needs to be done. But since you have limited resources and pressing deadlines, you will have to decide what is your main focus. Which leads us to the prioritization. As I said, the product roadmap keeps the team focused on the highest priority product initiatives. And at this stage of building the roadmap, having focus means saying no. Saying no means that most of the things you’ve just piled up won’t be done. That leaves you plenty of time to focus on those few work items which you’ve said yes to. Of course, this doesn’t mean that you will throw away some of the work items. They are just postponed for the next sprint, increment or release. I like to sort items into four categories: Now/Next/Later/Never. This kind of timeline helps you visualize your progress and prepare for what needs to be done in order to achieve your ultimate goal. Now/Next/Later/Never — things that you need to build now are clear. As you move further into the plan, work items are blurred but will be refined when the time comes. How to decide what to do now, what to do next and what to do later? 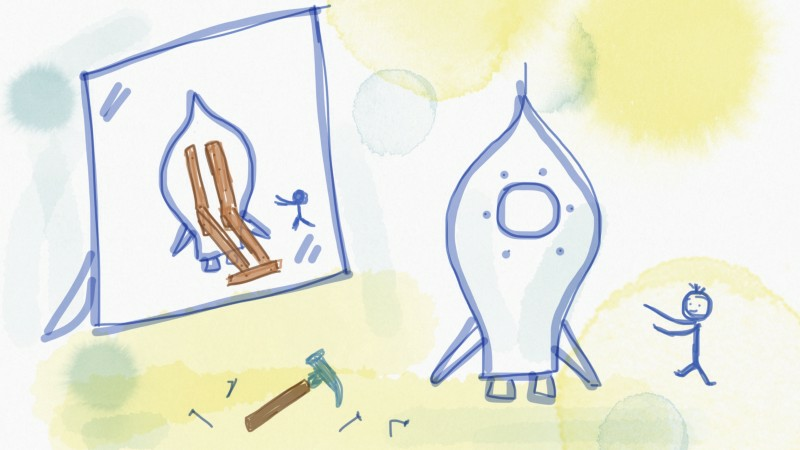 Since you want to launch your product, think of it as a rocket. In order to escape the gravity of wishful thinking, you have to crank up your booster and burn a lot man-month. This means that you should pick work items (features) which will bring you the most value for your effort, the biggest bang for the buck. These features will give an initial shape to your product, and set it on the right trajectory. Later on, you can work on those differentiating features and refine your product (trajectory). Thus far, you have a better knowledge of the customers, market, competition, needs and opportunities. This is the right time to revisit your vision. There is nothing new in this step, just a hint to revisit previous steps as you go. That’s why it’s labeled as a half-step. But I wanted to point out that the roadmap is not set in stone and it actually changes frequently as you go. It is likely that the market will change as the time passes by. Customer needs will also change, or you will discover a better opportunity as you learn more about them. This is why I insist on building a roadmap in iterations — learn as you go and adapt in accordance with that newly acquired knowledge. 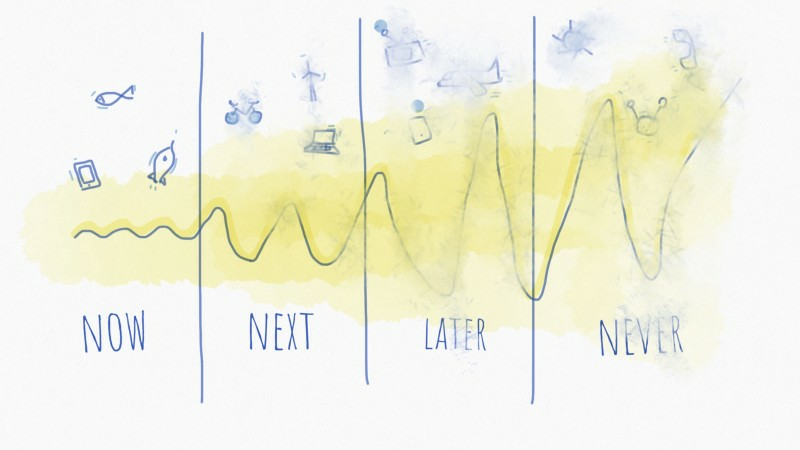 A good tactic for iterative roadmap planning is prototyping. Customer feedback is probably the most valuable input you can get. But sometimes it takes time to develop a product, and getting some negative reactions will drag you down, back to the drawing board. Nothing wrong with that, feedback is supposed to help you steer your ship, but sometimes you can get the same feedback with 10x less effort — prototype. Think of a prototype as a feedback on sale. You can get up to 70% discount on the same feedback if you build a prototype instead of the real thing. A good value for the money. A prototype will point out a fact about the customers: they are really good at articulating the problem space and react to solution space. And the reaction is what you need in order to solve their problems and make them awesome. Present the prototype as if it is the real deal, but build just a facade.